'Tis the season, so here's my little Christmas gift to you. Treat yourselves to a truly wonderful experience - one that can be accomplished with a little drive over a weekend. The big galoot you see above is an Alpha male Northern Elephant Seal. He will be around 20 feet long and weigh around 5,000 pounds. This time of the year he hauls out, along with several thousand others, onto the beaches just north of Hearst Castle on Highway 1 above San Luis Obispo. This colony, which makes two visits a year to this particular stretch of beach, has grown from a dozen critters in 1990 to well over 16,000 now. Last year more than 4100 pups were born to this colony. This colony is the most accessible in the United States - the main haul out beach is beside Highway 1 - and there is more than ample parking and a cadre of docents to help you understand what you'll be seeing. This is the beginning of "prime time" for this colony. The first pregnant females began arrivin g a week ago and the first pup was born on the beach on December 18th. These little guys - they weigh around 60 pounds at birth - will nurse for nearly a month, gaining around 10 pounds a day, ending up at around 350 pounds. When the female goes into estrus she stops nursing the pup, engages in mating with at least one of the males in attendance, then leaves the pup on the beach while she departs for her prime feeding grounds off the Washington/Canadian coast. You'll have a chance to see the large males establish and defend their harems - anywhere from 10 to 50 females - from interlopers. Usually, the Alpha males only have to pop their heads up from their normal snooze and the lesser bulls will scatter. However, it's not at all unusual to see bloody pitched battles between males as they try to establish their dominance. In these photos the two males fight to establish dominance, but neither will mate for a few more years, if ever. Only a very small percentage of these guys ever mate - 5-10%. In my opinion, the best time to visit the colony is from the middle of January through the middle of March. Since there is so much amorous activity going on, Valentines Day turns out to be a perfect time. The Martin Luther King holiday is also a good time to visit because you get an extra day. For my fellow football fans, the weekend preceding the Super Bowl is a great time - no conflict of priorities. OTTERS AND SEAL S AND ZEBRAS - OH, MY! Many days in January and February, in particular, it's possible to stand on the viewing boardwalk and see not only the elephant seals up close and personal, but view the otter colony that resides in the kelp just off shore. 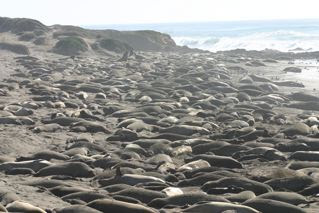 You'll also see Harbor Seals and seal lions in the rocks near the beach. It's even possible to see migrating whales and cruising dolphins. 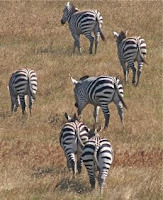 And, to further enhance your trip, the Hearst Ranch has a large herd of zebras that are usually visible from Highway 1 as you drive north from Cambria. You can read much more, including slides shows showing births, etc., at the website operated by the docents mentioned above, Friends of the Elephant Seal, here. I suggest you make a weekend of it by including a visit to Hearst Castle, which has recently renovated it's visitor center. Several tours are available. They also have an IMAX theater on the grounds where a docu-drama about the building of the castle can be viewed. Also, volunteers have, for the past few years, been cleaning up the grounds of the Piedras Blancas Lighthouse, which is immediately north of the elephant seal colony. Tours of the lighthouse grounds are conducted via the Hearst Castle Visitor Center. Further north a few miles you can stop at Ragged Point - the gateway to Big Sur - where it's possible to view migrating whales from the point. Accommodations can be found in nearby Cambria and San Simeon. Our personal favorites are in Cambria along Moonstone Drive, which now has a terrific boardwalk to enhance your visit. 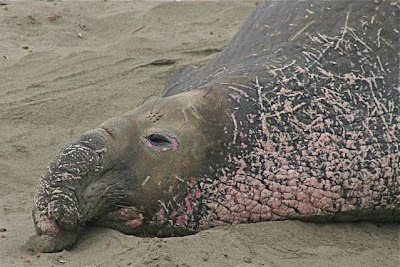 Trust me, regardless of your political leanings or whether you agree with all the other things discussed on this blog, you're going to love the experience at the elephant seal colony. I wish you all a very Merry Christmas and Happy New Year. Looks like a lot of fun - thanks for the info!